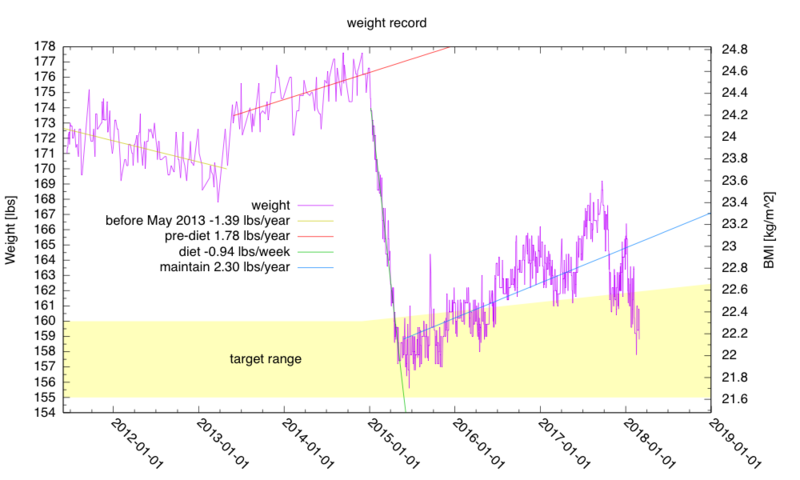 My weight has fluctuated a lot in the last year, but I’ve stayed pretty much in my target range for February. It is probably about time for me to pick new breakpoints for long-term trend lines. I can’t really pretend that my “maintain” period is really modeled well as a single straight line. 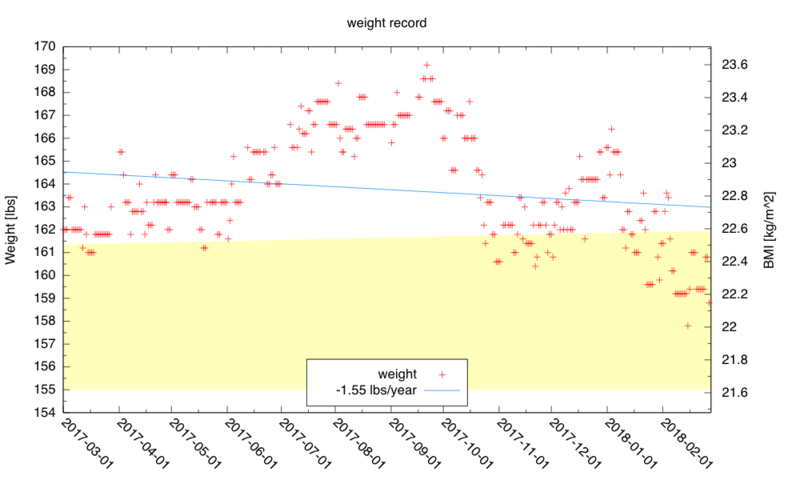 My goal is to stay in the middle of my target range (~158 lbs), but this may be harder to achieve than I had originally envisioned three years ago when I started on the weight-control effort. I’ve been skipping lunch entirely lately, which makes me a bit hungry on the days when it is 14 hours between breakfast and dinner (mostly Tuesdays and Thursdays when I have late lab classes to teach). February had me riding an average of 4.78 miles a day—about normal for a 5-day-a-week commute with a tiny bit of weekend errand-running. I have had huge grading loads most weekends, so sometimes I don’t even get time to do a short errand like biking down to Trader Joe’s for soy milk and cereal. I’m still thinking that I’ll try doing some running this summer, not for weight control but to start training for running a marathon when I retire. The longest distance I’ve ever run was 15km, and that was about 47 years ago. I was recently told that Bike Santa Cruz County (that is the renaming of the “People Power” group that used to meet in my living room, back when I was a bike activist) sponsors a 12km run on 26 August 2018, mostly on flat dirt trails at Wilder Ranch. If I plan on building up to longer runs by increasing length by 1km each week, then I’ll have to start training around Memorial Day. My initial training will be very easy, perhaps on the UCSC 800m track or the Santa Cruz High 400m track (both approximate measurements on Google maps). Later in the summer I will probably alternate long days (leading up to 12km by the end of August) and short days (1–2km). On short days, I should probably do some cycling to maintain some cardiovascular fitness—cycling up to the UCSC track to do two laps would probably make a decent short day. A first time marathoner with a few years on their body might look at this training program. http://www.jeffgalloway.com/training/marathon-training/ It is low impact compared to a regular running training program. I have many friends that claim it is the best thing they have done for their distance program. You will not be fast but you will not damage anything and you will finish. I used to be a long distance runner (marathons and ultras, had to quit due to Achilles tendons being shredded from too many miles) and this is a great approach. I have switched over completely to bicycling and hiking. I do mostly mountain biking but there are some good road rides in my area. A lot less impact on the legs than running (but a lot more when I miss a high speed corner when on the trail and go winging off into the trees and bushes). Thanks for the pointer. I’ll look at it when I have time. I agree that bicycling is generally less damaging than running, barring major crashes, but my interest is in seeing if I can do a marathon in the next 5 years, not in taking up long-distance running as permanent hobby. I only do commuting, not mountain biking, but I did manage to have a serious accident 18 years ago, which required removing my spleen.